There was no drumroll and no marching band when we re-entered Ryōzenji, Temple #1, from which we had started our long pilgrimage two months ago. We began our pilgrimage very unceremoniously in this busy temple by the noisy road, and it ended with the same lack of ceremony. Back then, we were disoriented and confused about the enormity of this task… Now when we walk without our heavy backpacks, we feel like two agile gazelles. Nobody but us can truly know how far we have come, how much insight we have realized, how many inner waves we have surfed…. A pilgrimage is indeed an inner journey, and you have nothing external to show for it, because most of the terrain, mountains, coastlines and obstacles that you have walked and had to overcome, were always inside of you. On the surface, this was a long walk along an ancient countryside stringed with myths, legends, ancient temples, stories and historical facts. But a pilgrimage is very much like life – it is a never ending journey. It is not about a destination nor about arriving somewhere in particular, but about the richness and depth of the journey…. And the journey never ends…. Jules adds: “I have been a life long reader and I love reading about inspiring adventures. But I have found that reading about an experience, is not the same thing as having that experience yourself. Feeling like a spiritually advanced person from the comfort of our big sofa, is not at all the same thing as seeing which of the 10,000 states of mind, I find myself occupying while on a long walk in the stifling heat. The pilgrimage doesn’t reveal itself as a series of one day hikes, which, after all, sound simple. It’s the day after day of a never ending walk in all weather conditions that leads to going deep within. Today we walked between Temples #3, #2 and back to #1, but we did not wear our pilgrim’s jacket or hat. The woman in the office at Temple #3, was surprised and delighted to see our book full of stamps. Then when we left, I told Jules that it will be hard for us to speak of ourselves in the past tense, as if we WERE pilgrims. We ARE pilgrims and will stay pilgrims for life…. Just like I will never be able to say that I used to study metaphysics and spirituality, I will not be able to say that we used to be pilgrims…. We ARE pilgrims… Always looking for higher truths…. 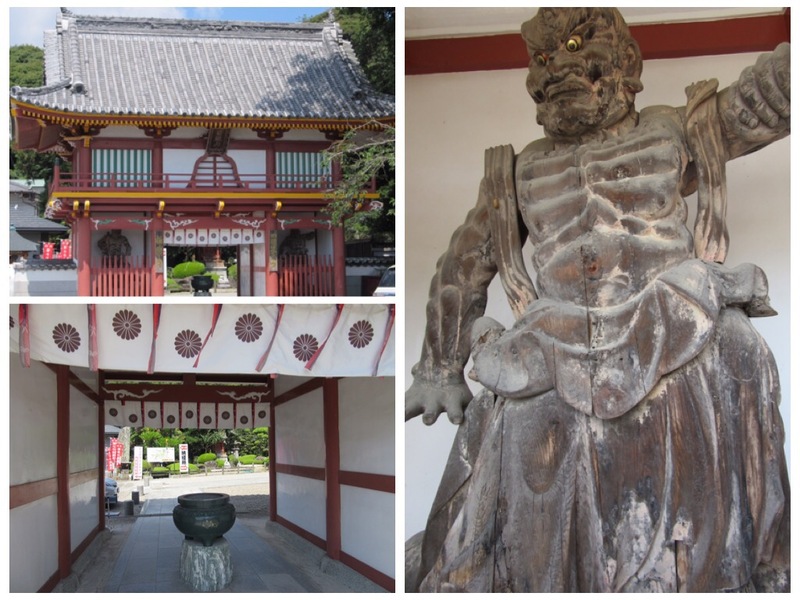 From temple #1, we took the bus to Tokushima city. Since we had no breakfast when we left Takamatsu, Jules went into the Starbucks and ordered us tea with soy milk and vegetable wraps. I walked over to the Daiwa Roynet hotel in which we stayed two months ago, and reclaimed our bag that we left there for safekeeping. Then I walked over to the Uniqlo store and bought myself a new white shirt and a casual jacket. When I wore the shirt tonight as we walked to have dinner, I felt like I had reentered normal society. For the first time in months, I looked presentable and I even noticed that people looked at me differently…. Without pity and with more respect….. It is funny that they say that clothes do not make the person. It is undoubtedly and absolutely true, but we do live in a world where the way you dress, is very much judged by others. After we finished our tea at Starbucks, we left Tokushima and took the express train back to Takamatsu. It took only one hour, and we were back in our hotel in Takamatsu. We have one more day in Takamatsu, which we plan to spend as tourists, taking the day ferry to Teshima Island to see some art. Then we will take the express train to Osaka where we will stay two nights and try to find me a new camera. The one I have is experiencing an electrical short when I try to use the flash. It is very new, but it was damaged by water from the many days that we walked in the rain. We decided to go home to Colorado early, instead of going diving in the Philippines or staying in Japan. The beach idea does not appeal to me now, since I feel that I have had enough sun to last me a long time…. and to oil it as best I could, but the parts of it that were in the sun daily, got burnt. Sweating under a hat for two months, also does not make for healthy hair. My arms and face are a little sunburnt and I am very tired. I have art to ship to collectors, and we need to apply for our Indian Visas, for our upcoming trip to Ladakh, Kashmir and Rishikesh. It costs us to change our ticket to go home early. We had to cancel the one way tickets that we had for a refund, and then we booked new tickets to fly earlier from Osaka to Denver. We will still fly to Los Angeles to be with my sister and mother as scheduled, only we will do it from Colorado, instead of coming from Japan. I am looking forward to doing a juice fast and a detox, to cooking my own food and to sleeping in my own bed, to laying down and reading a book for days, to being in my studio and painting again…. I am also looking forward to the quiet of the Rocky Mountains and for the dry mountain air…. Even if we will only have a short month and a half to enjoy it this time…. We are O’Henro for life…. Thank you dear Lin for following our journey!!! Congratulations for your achievement and enrichment. I went to Myanmar in march with my 5 year old daughter. Your site and blog about Palaik Snaketemple and the remote temple area next to it, led us on adventures. Great adventures among Buddhist and golden temples, thanks to your pictures and text. I started then to read about your preparation for your pilgrimage to Japan. And got interested in your artwork. Since your start two month ago I have followed your post every day- in text and geographic! You are an inspiration. describing how you feel and think directly from your heart. Pacing down. An achievement that can only be done by taking your time. Thank you for letting me follow your journey step by step. I feel I know you a little bit. At least I can recognize some of your thoughts about faith, doubts, calmness, fear. Thank you so much for your most kind and wonderful comment. Thank you also for following our journey. It is so heartwarming to know that you enjoyed reading it and even was inspired while you visited Myanmar. I am so touched and inspired. Thank you for taking the time to congratulate us.